Tomorrow, the St Andrews School of History will be hosting a workshop on the subject of ‘Literature and Union’. The workshop, which is an outcome of a Carnegie Grant awarded to Professor Colin Kidd just under a year ago, will be taking place in the Old Class Library at St John’s House, South Street, between 10am and 5pm. 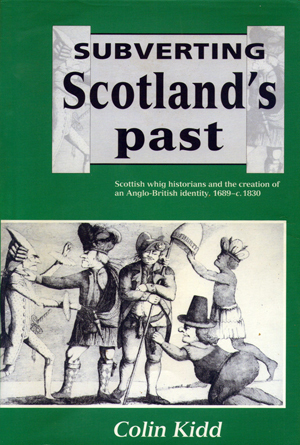 The workshop will open with Professor Roger Mason on ‘Mair and After’, and will conclude with a special event to mark the publication of a new edition of Professor Christopher Whately’s The Scots & the Union: Then and Now (EUP, 2014). The full programme can be consulted here. Interested parties are welcome to attend any or all of the sessions, although spaces for lunch are now full. Nathan Alexander was born and raised in the town of Fort Erie, Ontario, Canada, but has lived in various locations across Southern Ontario. 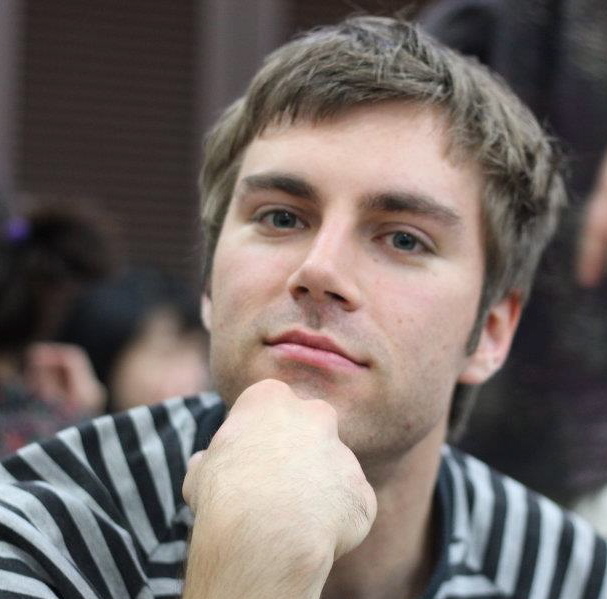 Before coming to St Andrews, Nathan spent two and a half years teaching English in South Korea to every possible age group, from kindergarteners up to adults. Although he misses the hustle and bustle of Seoul (not to mention the kimchi), he is glad to be back in academia and studying in the comparatively laid-back atmosphere of St Andrews. Nathan became interested in history in high school, when the September 11th attacks and subsequent wars in Afghanistan and Iraq spurred his interest in world affairs and led him to want to make sense of why the world is the way it is. Considering the study of history the best way to do this, he undertook his B.A. in Honours History at the University of Waterloo and later his M.A. in History at Wilfrid Laurier University (both in Canada). Nathan’s historical interests have seemingly changed from year to year. He initially intended to focus on Canadian history, but then became interested in American history, before settling on African history for a time. For his master’s, he combined his interest in African history with yet another new interest, the history of the idea of race. Studying under Professor John Laband, Nathan examined British views of the Asante (a West African people in modern-day Ghana) in the nineteenth century. 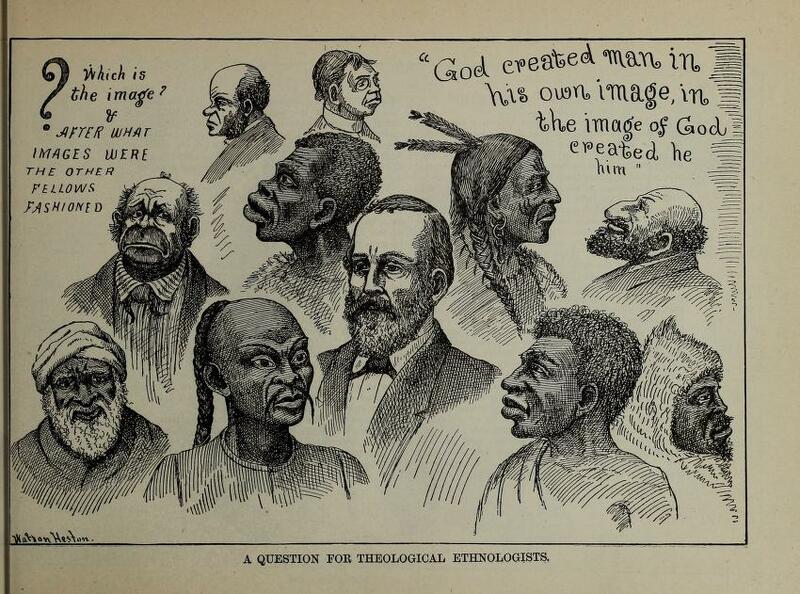 A cartoon which appeared in the American atheist periodical, ‘The Truth Seeker’, in the late nineteenth century. A convert to the New Atheist movement ­– although not always agreeing with its chief proponents – Nathan has once again moved on to a new subject and now studies atheists, agnostics, and other freethinkers in nineteenth-century Britain and the United States, and considers how they engaged with the idea of race. 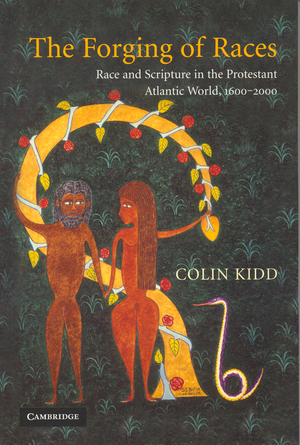 Nathan’s doctoral research, supervised by Professor Colin Kidd, brings together two bodies of literature, on the history of race and on the history of atheism, that have previously seen few points of contact. While the influence of Christian thought weighed heavily upon conversations surrounding race, from the origins of supposed races to the legitimacy of slavery, surprisingly historians have not yet studied how non-religious people thought about race. More broadly, the history of atheism at the university level is regrettably understudied and Nathan hopes to contribute, if in a small way, to reversing this trend. Nathan’s fingers are crossed that his historical interests will remain stable for at least long enough to complete his dissertation! In addition to the work on his PhD, Nathan is kept busy through his involvement with the Institute of Intellectual History and his work as editorial assistant with the School’s communications team. In this role, he prepares the fortnightly School of History Gazette, as well as working on the School’s annual alumni magazine. He is also an editor of the Nonreligion and Secularity Research Network’s blog. Nathan has presented his research at the University of Victoria (Canada), the University of Glasgow, the University of St Andrews, and in the summer will present at the University of Newcastle. Outside of his academic pursuits, Nathan enjoys swimming and playing basketball. He is a keen follower of the Toronto Raptors basketball team and, as a Canuck, is an obligatory (ice) hockey fan. He is a chess player as well and likes to imagine himself as a modern-day Bobby Fischer, hopefully minus the conspiratorial rants. 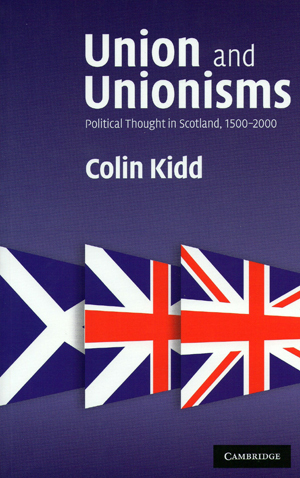 Prof. Colin Kidd has been awarded a Carnegie Larger Grant to fund a series of four workshops in St Andrews on the theme of Literature and Union. The four workshops will explore the topics of ‘1603 and 1707: Literary Contexts, Consequences and Comparisons’, ‘Smollett, Johnson and the Literary Battle of Britain c. 1760-1776’, ‘Scott, Rosebery, and Literary Patriotism within the Union’ and ‘The Triumph of Nationalist Rhetoric from MacDiarmid to the Present’. The Literature and Union workshops will lead to the publication of a volume of essays on Literature and the Union. Prof. Kidd‘s workshops are warmly welcomed to the programme of events hosted by the Institute of Scottish Historical Research and the new Institute of Intellectual History. On 17 April 2013, Prof. Colin Kidd gave the John Burrow Memorial Lecture at the Centre for Intellectual History at the University of Sussex. Prof. Kidd spoke on the Trials of Douglas Young. Podcasts of the Sussex Lectures in Intellectual History series can be downloaded free of charge from the iTunes store or from the Sussex Intellectual History website. Prof. Colin Kidd arrived at the University of St Andrews in the summer of 2012. Originally from Ayr on the other side of Scotland, he taught for over fifteen years at the University of Glasgow and, more recently, had a short spell at Queen’s University Belfast. He relishes the seemingly brighter light and fresher air of Scotland’s east coast, as well as finding St Andrews a remarkably friendly and congenial university in which to work. 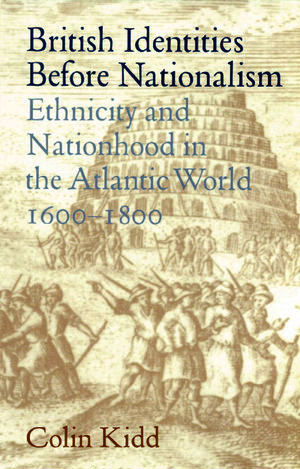 Colin’s current research focuses on the intellectual history of the English Enlightenment and its nineteenth-century aftermath, particularly in fields such as antiquarianism, mythography and religious apologetic. Eventually, many years hence, these obsessions will intersect with an emerging interest in the history – and prehistory – of British anthropology. Colin is at his happiest riding these particular hobbyhorses, but he also has a stable of other subjects which fascinate him. These include constitutional theory, British as well as American, and the church history of his native county of Ayrshire in the age of Enlightenment. However, he is alert to the possibility that the parishes of eighteenth-century Fife might yield up treasures of their own to delight the connoisseur of theological controversy. Colin teaches on courses at various levels at St Andrews. He is involved in two team-taught courses, MO2008 Scotland, Britain and the World 1500-2000, and HI2001 History as a Discipline. He is thoroughly enjoying teaching historiography in a formal course setting for the first time, several decades after discovering the topic, by way of Pieter Geyl’s classic, Napoleon for and against, which he found on the shelves of the Carnegie Library in Ayr between his fifth and sixth years at secondary school. Ever since Colin has felt the lure and enchantment of historiography, but has never had the chance to teach it in a bespoke Historiography course. In addition, Colin teaches three third level courses to Honours classes, on MO3713 Nationalism and Unionism in Modern Scotland, on MO3220 The Enlightenment and the World, and on MO3715 The American Constitution: Past and Present. 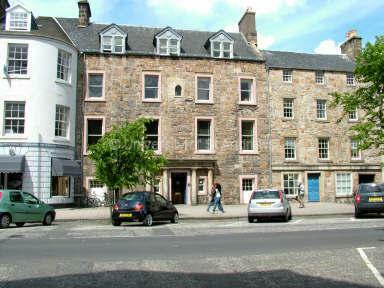 Colin has been enormously impressed by the standard of Honours students at St Andrews in these areas, particularly the insight and sophistication displayed by undergraduates working on the theory, context and significance of American constitutional law between the late eighteenth century and the present. Colin has spent his adult life in History departments of one sort or another, but is still not quite sure if he is an historian. He is increasingly interested both in Literature and in Political Science, and enjoys dabbling in other subjects, much to the irritation, no doubt, of their professional practitioners. For more on Colin see his School of History webpage, the out-of-date wikipedia page devoted to him, his London Review of Books contributor page, his All Souls College Oxford Fifty-Pound Fellow page, and his page as Fellow of the British Academy. 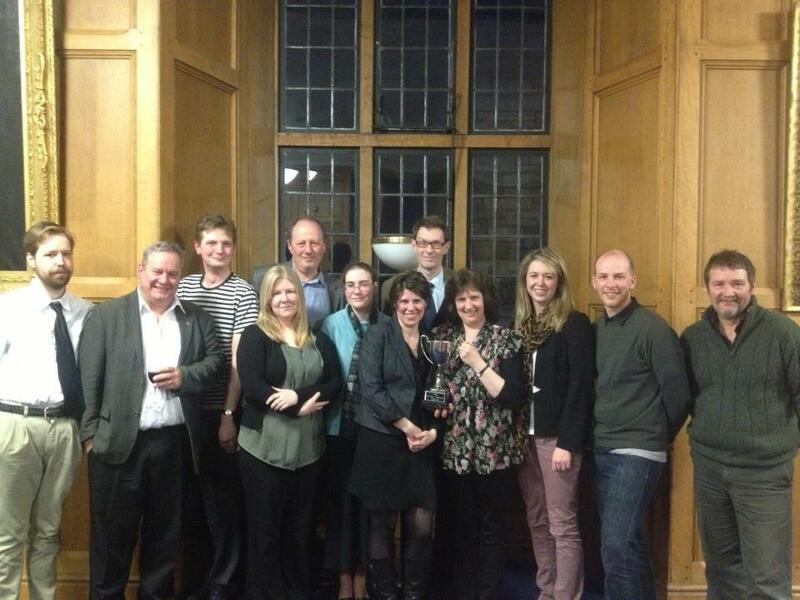 Each year a handful of only the bravest tutors make their way to the History Society’s Interdepartmental Quiz (IDQ). The quiz pits the brains of Ancient, Mediaeval, Modern and Scottish tutors against each other in a battle to be crowned IDQ champions. 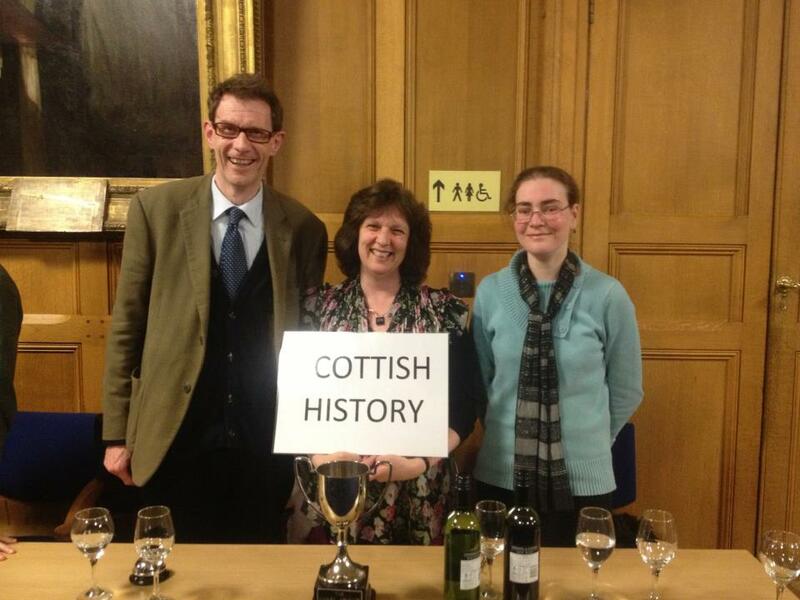 The teams this year were: Dr Jon Coulston, Mr Risto-Matti Sarilo & Mr Emerson Stevens for Ancient History; Professor Chris Given-Wilson, Dr Justine Firnhaber-Baker and Dr Katie Stevenson for Mediaeval History; Professor Conan Fischer, Dr Kate Ferris and Mr Nick Blackbourn for Modern History (defending champions) and for Scottish History, Professor Colin Kidd, Dr Christine McGladdery and Dr Jacqueline Rose. There were five rounds; four based on the respective historical periods of the teams and a general knowledge round. Each team was given the chance to answer questions relating to their own historical period. If a team could not answer the question the other teams could use their buzzers (in this case a tambourine, a horn, a bell and a frying pan) to grab double points. 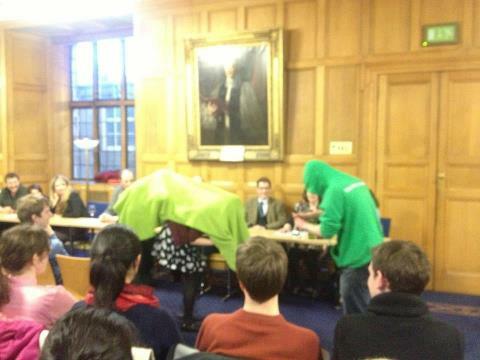 After a hard fought battle, and some dodgy historical re-enactments by the History Society committee, Scottish History took the lead with an impressive 24 points, beating Medieval (19pts), Ancient (18pts) and Modern (5pts) and claiming IDQ victory for 2013. Can Scottish hold on to their victory or will someone else claim supremacy in 2014? We’ll have to wait and see.